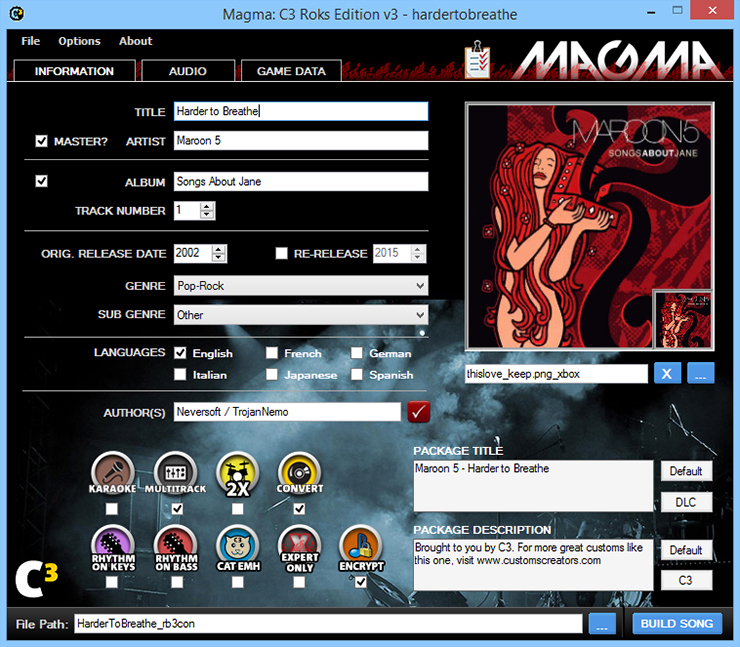 This is Magma: C3 Roks Edition - our take on HMX's tool for creating songs for the Rock Band Network. Magma: C3 Roks Edition is the culmination of hundreds of hours of programming and the cooperation between several of our members hoping to keep the customs community alive. This is the definitive version that all RB3 customs creators should use. 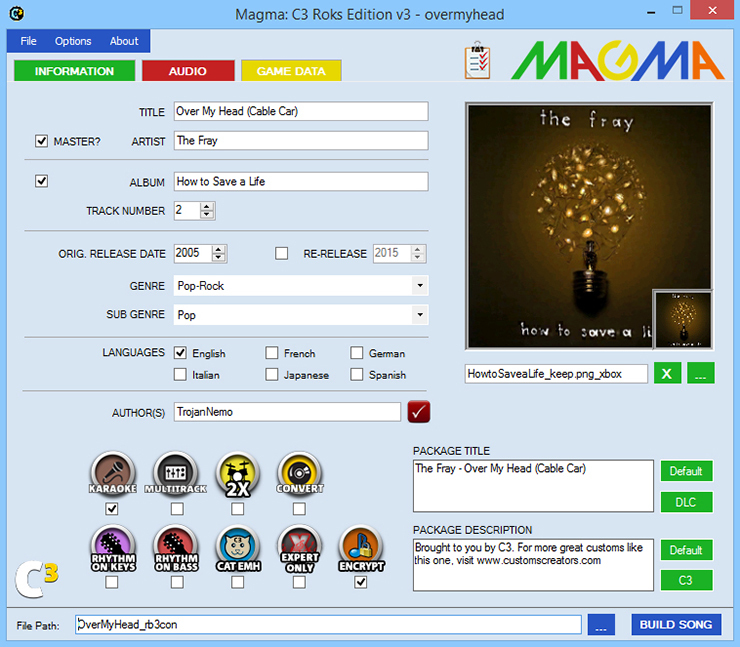 Read the FEATURES below for an idea of what Magma: C3 Roks Edition can do. How did you do it?! Did you break into HMX's vault? Quite the contrary, we actually started with the same Magma files that you have, which HMX made available freely to anyone who wanted to author for the Rock Band Network, and we ended up with this. How? Reverse engineering by decompiling Magma.exe and hacking MagmaCompiler.exe in assembly language. That's it. And countless hours of non-stop programming. Unless you're coming from a really old version of Magma: C3, you should extract these files over your existing installation so no settings or important files are lost. DO NOT INSTALL IN PROGRAM FILES. I hope you're as excited to use this as we are to share it with you. - MagmaCompiler has a 1MB MIDI file size limit - thanks to raynebc, Magma: C3 includes midishrink, which will compress your MIDI file, but if even after compressing it is over 1MB in file size, MagmaCompiler won't accept it. This. Looks. Awesome. Amazing work guys! Holy crap guys, that's amazing ! Thanks for spending so many programming hours on that Nemo, I'll use it from now on and let you know if anything goes wrong. I had a feeling you were doing this Nemo. Since my other post in the forum made you chuckle suddenly. Haha. This is just what everyone needs. Now I can do the whole Albuquerque song instead of an RB3 version. Thanks for all your hard work. Fantastic work. And here I'm leaving home for a week and won't get a chance to play with it! indeed. its unfortunate that MagmaCompiler is not so we can only get so much out of it in assembly. still I think this tool will change the way we make customs. I just wish I had done this 2 years ago! You might not have even had the skill for it two years ago! Anyway, one potential feature to consider might be allowing a wider range of difficulty ratings, numerically, while still providing the "rounded" dots view. would you believe my first foray into C# was about 4-5 weeks ago when I decided to make the album art converter and got the source code for rb3maker? anyways, as far as adding extra difficulty ratings, RB3 will only recognize what it's set up to recognize, so i can't go make RB3 show you anything beyond the existing tiers or "in-betweens"...so the only thing we can do is in Magma and in Visualizer show in-between steps so something like 1, 1.5. 2, 2.5...but i don't think it's worth the effort since in game it will still use the same tiering system. Interestingly, my first foray into C# was /also/ looking at old RB3Maker source and using it to figure out how to build the very first RB:HP packager. disabled 10 minute check - create songs of unlimited length with lipsync! Also, one thing I noticed. When I go to save a file, like for example when I'm just working on the rbproj. file. When I press save, it wants me to name the file again. Even though I just clicked "Save", it's acting like I clicked "Save As". If that makes sense. "- changed default paths to match input files = reduce time searching for audio, album art, etc"
This alone is significant. Thanks! Amazing Feat. i know why. i'll find a solution. it's kind of weird how this thing worked originally. i'll add it to the few things i'm going to fix in the next hour or so. in the meantime, can one of you tell me how long a song id can be before it breaks the game? according to farottone's testing, a song id that is 25 characters is fine, a song id that is 31 characters breaks the game. i'd love to know exactly how many characters I need to limit it at. right now i'm on the safe side and using 25. if you guys know otherwise, or can experiment with a few files, let me know. actually, can't replicate what you're saying. if I open an existing project, and I click save, it saves without asking. if it's a new project, and you click save, it is intended to default to save as since you need to assign a name to the project first! No. I open a recent project, and for example if I edit the tier on an instrument or do something that changes something from the project and then click save, the window pops up and says "Save As". That's weird that it only happens to me. Sounds like the original file is protected or open. updated. same link in the OP. - song id is now done correctly. last release would only check the length of the first time it shows up, now both times 'songhere' and song_id 'songhere' match. this is my first "ready for public release" (i think) version. let me know of anything to add or fix.